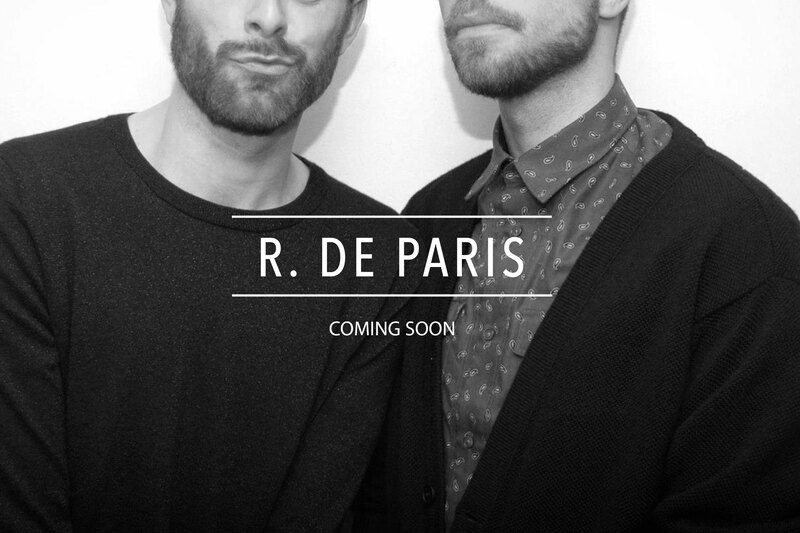 For the past few weeks, I was working with a couple of Parisian designers in shaping their new brand, R. De Paris. This new men’s brand is all about the hipster who meets the Marais to create the new community of ‘Haut Marais‘. For the brand, I was able to develop their logo which is an updated version of what they had originally thought of themselves. The original font was a serif font a-la Times New Roman that was set up in sentence case. My immediate reaction was to change the font to a sans serif. This change alone brought the brand from the out-dated to the modern. Not to say serif fonts are bad, but once you get to know the designers, see the collection and get a feel for what their brand is, the old type font wasn’t a good representation. I played around with dozens several sans serif fonts and changed the text to all caps, all lowercase, mix, toggle, etc. The designers really wanted to keep the two lines in the logo so the challenge was to find a font that would be complemented by the extra weight above and below it. I finally settled on Avenir Next Condensed Medium in all caps. The font was able to fit within the lines without looking too big or small in the middle space. The all caps put all the letters at the same height so there is no emphasis on any word or letter. To also get the boys excited about their brand, a few friends and I set up a photoshoot to get the boys modeling a part of their accessory bow tie collection. With make-up artist Wallace Woo and a close friend photographer in place, the guys had so much fun showcasing their hand-crafted art pieces. The pictures came out amazing and definitely the style we were trying to create of discreet luxury. Take a look at some of the final pics below and the short video we were able to put together. Start following these two designers now on Facebook, Twitter, and Instagram to get a behind the scenes view of what two guys living in the ‘Haut Marais’ do to create their upcoming SS15 collection!! Previous Post Tommy Hilfiger Is That You?